This article provides helpful tummy time exercises for babies that hate to be in the prone position. Affiliate links and free printables are included for your convenience. Integrated Learning Strategies (ILS) is a learning and academic center. As a reminder, ILS is not a health care provider and none of our materials or services provide a diagnosis or treatment of a specific condition or learning challenge you may see in your child or student. If you seek a diagnosis or treatment for your child or student, please contact a trained professional who can provide an evaluation of the child. It’s not uncommon for babies to hate tummy time. Many parents think because their baby cries or fusses when they try to lay their baby on the floor that they are bad parents or that their baby needs to be rescued. This is not the case. Tummy time is essential for every child’s future learning development and all parents should encourage tummy time activities as much as possible. 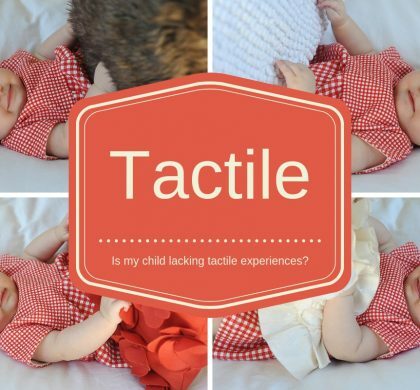 The trick is incorporating the “right” types of tummy time exercises that will positively engage your baby without tears while also building the connection between you and your child. What most parents don’t know is that you can begin tummy time right after the baby is born. Parents can lay their baby on their chest while the baby sleeps during the day or they can lay them over their lap and rub their back. Both of these simple activities while the child is in their infant stages, builds the connection between you and your baby. Print or save your copy below. While all babies are encouraged to sleep during the night on their backs to prevent Sudden Infant Death Syndrome (SIDS), it has also caused new concerns about the infant’s head shape, especially if the child is left on their back or supine position for most of the day. Children who spend a majority of time lying on their backs in car seats, rockers or under mobiles, can develop a misshapen or flattened head. Why does that matter? A child’s brain grows at an amazing rate in their first year of life. If a baby develops a lasting flat spot on either side of the back of the head, called flat head syndrome or positional plagiocephaly, the baby can develop problems with the neck and head muscles, and it could provide less room for the brain to grow. 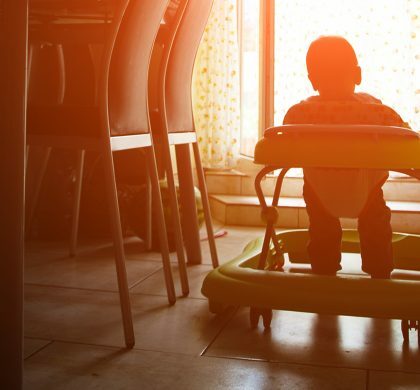 As a result, several children may be prone to developmental delays, sensory issues, speech and language trouble and possible attention and focus issues in the classroom. If your baby begins to cry as you introduce tummy time into their routine, it’s important to know that it is not because the baby is in pain or is uncomfortable. Generally, it is because the activity we are asking the baby to do is developmentally beyond their reach. This is the first step toward building the baby’s muscle tone in the arms, legs, neck, head and torso needed for crawling, walking and eventual reading and writing in the classroom. Giving your baby enough tummy time or time spent in the prone position (stomach) will help them build the muscles in the neck to eventually lift their head. Believe it or not, this simple task is one of the biggest problems in the classroom. Many children with learning challenges don’t have enough muscle tone in the neck, head and shoulders to copy notes off the chalkboard and get their thoughts down on paper. As the baby becomes stronger, they will lift their torso and head off the ground as they push their body up with their arms in the cobra position. This position not only builds your child’s arm strength and beginnings of fine motor development needed for handwriting and pencil grip, it also allows the baby to move from side-to-side, which helps with balance, coordination, visual tracking for reading and postural control needed for sitting upright in their chair so they can listen to the teacher. If babies are confined to activities on their back, they often become bored. Babies need to explore the world and environment around them to develop their senses for better sensory integration. We want babies to become confident and curious to prepare for other developmental stages like crawling. Restrictions in these areas could potentially cause sensory issues, emotional delays and attention and focus issues later in life. How much tummy time is recommended? There are varying opinions on how much tummy time your baby actually needs to enhance their development and brain activity. Some physicians recommend a minimum of four waking hours in the prone position that can be broken up throughout the day. This includes the time babies sleep on their tummies during the day (not at night). However, when babies are younger than three months old, at least 30 to 60 minutes of tummy time is most likely good in the infant stages. By three months, you will want to increase your child’s tummy time to 90 minutes per day (small increments are best). Continue to increase the length of time your child spends on their tummy as they grow and develop. Research shows that babies who spend at least 80 minutes per day playing on their tummy while awake are more likely to reach their milestones faster than those who spend less time on their tummy. If your baby cries or fusses while on their tummy, here are a few exercises to try that will still help their development, but can prevent the tears. When your baby is awake and spending time on their tummy, place a few colorful toys in front of them. We like to use sensory bean bags, toys that make sounds, squishy balls, stuffed animals and other colorful toys that encourage reaching. Now you can step away and let the baby explore their world right? Wrong! Walking away could actually trigger the crying and wanting to be held. 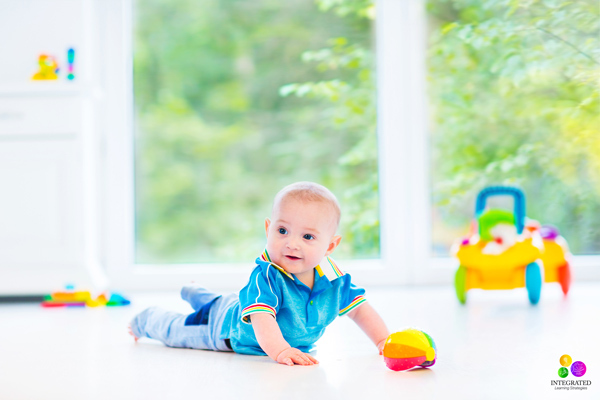 Parents should get down on the floor with their child and help them grasp and reach for the toys in front of them. Additionally, talking to the baby and saying words of encouragement can reassure the baby, calm their fussiness and is also a great tool for developing their speech and language skills along with their expressive and receptive communication. The superman is a big hit with babies that hate tummy time. Babies can only be on the floor for so long before they are ready for a new challenge. For this activity, lie on your back and pick the baby up over your head. 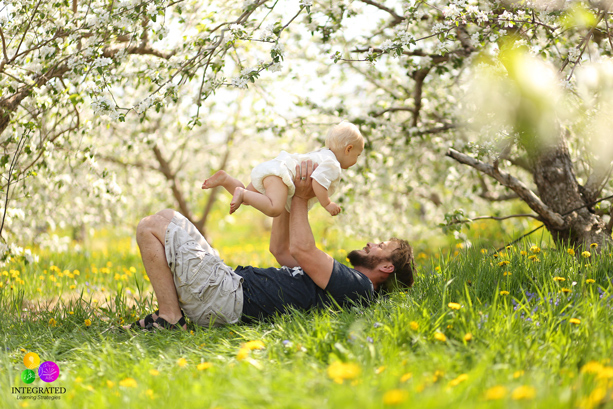 Bring the baby toward your chest and then push them up in the air like superman. It’s basically like doing push-ups in the air. Repeat the exercise as many times as the baby likes. Talk to the baby while they are flying up and down and even kiss their cheeks and their neck, giving them the physical touch they need to feel connected to you. This activity often makes the baby laugh, giggle and babble, which is all important for speech and language development. It also strengthens the neck muscles and develops the baby’s depth perception needed for visual tracking (reading) and other important visual-motor skills. It’s also a great workout for parents! If your arms get tired, switch up the superman exercise slightly. Stay on your back and lift your legs 90 degrees in the air. Place your baby on top of your legs (between your knees and ankles). Hold on to your baby’s arms or torso and bounce them up and down with your legs. This activity is also great for making your baby laugh and talk. Getting your child started on the peanut ball the younger the better. Peanut balls are especially good for helping your baby, toddler and young child build the muscles in the head, neck, shoulders, torso and legs. In addition, this activity begins to help build your child’s vestibular system needed for attention and focus in the classroom. For babies, place them in the prone position on the ball. You may need a partner for this activity. Roll them forward and backward on the ball while holding them. You don’t have to have a partner, but if the baby’s sibling or your spouse is available, you may want them to sit in front of the baby while they are on the ball so they can engage with them to reduce crying or fussiness. As your baby grows, this activity becomes more important. While they are little, you can set up different stations around the house with different toys and items that encourage tummy time. Changing their environment can keep the baby happy and interactive. As the child grows older, baby stations are especially important for encouraging crawling. Placing different stations around the house that are easy for the child to get to, encourages reaching, grasping, scooting and eventually, crawling. 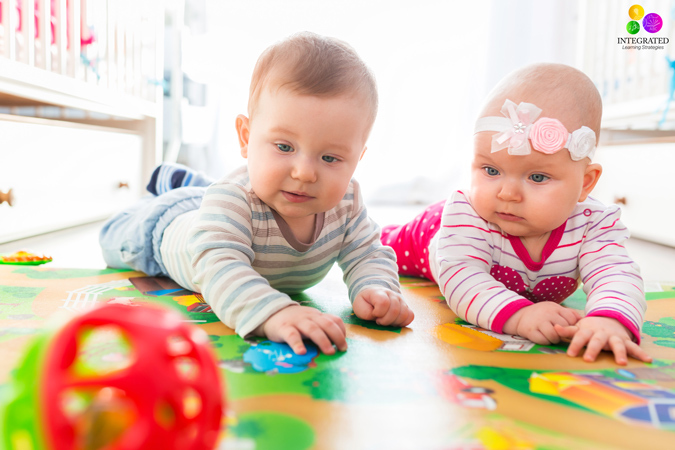 While there are some babies that don’t crawl and turn out just fine, there are several that have developmental delays or learning challenges in the classroom later in life if they skip the crawling stage. If your baby is not old enough or doesn’t have the strength yet to lift their neck, head and torso, roll up a towel and prop it under your baby’s arms and chest for better support. This way they can still see what is going on around them, which can reduce crying, but more importantly, it can improve their visual skills for reading and core muscles for postural control in the classroom. As an alternative, we love putting these fun plastic blow-up tires under babies for greater support. You may need to hold their waist, but it gives them something to grab, squeeze (fine motor) and chew on (oral sensory development). In addition, you can also use a pillow or blanket to prop them up, but don’t leave them unsupervised. Print your own copy of these exercises and the learning benefits that come with tummy time for FREE. Complete the information below to print or save your copy.